Imagine what Europeans experienced during the age of discovery, roughly 1500 to 1550 AD. New continents were being discovered and the world was being shown to be a far more diverse and complex…and wonderful …place than originally thought. Ships were frequently returning from uncharted lands, their holds crammed full of strange and wondrous new life forms, tribal art, and even the strange looking tribesmen themselves. Meanwhile scholars at home doing their renaissance thing were learning so much…about astronomy, printing, optics, alchemy, medicine, philosophy, art with perspective, etc. This explosion of new insights showed God’s world to be all the more awesome, man all the more capable, and life filled with all the more wonder. Not surprisingly, noblemen, scholars and merchants went down to the docks and bought this new-world cool stuff… the seashells, the wild plant material, the “unicorn” horns, the feather headdresses… and brought it home. And they added the products of local artisans and artists, demonstrating virtuosity of the highest order…still lives so realistic you had to tap the canvas to find them two-dimensional, turned carvings of incredible delicacy and complexity, classical sculpture so life-like. And all these were placed in purpose-built rooms, wonder chambers or (in German) wunderkammern, which created a microcosm of the whole world right in your home. These rooms were designed to overwhelm you with a sense of wonder, or in modern parlance, to blow your mind. My purpose here is to promote interest in these wunderkammern (one wunderkammer, two wunderkammern…sorry, German) to the point where the reader will learn about them, consider visiting some, and perhaps build their own. For the world is a wonderful place and we should more often celebrate that fact. The literature and internet happily are full of information on this topic. And many beautifully illustrated books were produced in the 16th and 17th centuries as well as in the 1980’s ’90’s and ‘oughts. What I found missing was a practical guide to help you visit them in person. And that’s what I propose to write about, visiting them and seeing in person: the cacophony of form, the bouquet of color, the quirkiness, the opulence, and the stimulus for the curious. But wait. There’s a recession/depression going on. There are wars being fought with people dying. What relevance could what renaissance people did up to 500 years ago possibly have today? One thought is that then just as now the steepness in the progress curve is especially pronounced and the explosion in knowledge remarkable. A second is this: back then, Europeans were discovering the rest of the world for the first time. History then shows that a period of European exploitation of these new worlds followed, sometimes being rather hard on the newly discovered peoples and places. Today it seems we of European descent are discovering the rest of the world AS AN EQUAL for the first time. Militant Arabs can blow up our buildings, the Chinese economy profoundly affects ours, our environment’s well-being is impacted by the health of the Brazilian rainforest, and an African American is our president. So with renewed respect let’s celebrate the awesome diversity of our world! Generally there were few rules governing the creation of a wunderkammer. 1) Be broad in your collecting. These after all were renaissance men. But the impetus to be broad was more than good manners. Consultants in this field back then advised you to be so broad that you were creating a microcosm of the entirety of God’s world. 2) Use symmetry where you can in your display. 3) Heighten the magic of your presentation by juxtaposing unlike objects for dramatic effect. Otherwise, there really weren’t rules…so the collections tended to be a very personal reflection of the owner’s interests…sort of your own 3-D walk-thru sculpture. And no two were alike. Nonetheless, you can fit them into categories, based on their date founded, contents, and status of the owner. The first period wunderkammern were founded say 1550 to 1650. They tended to be extraordinarily diverse in their contents and, to our mind, chaotically presented. Classification schemes, such as Linneus’ for plants and animals were 150 years in the future so first period collectors grouped things free of any such notions. They might group all the round life-forms together…sea urchins and coconuts, and the square ones together, etc or they might group together things made of the same materials regardless of the items’ history, thus the “unicorn” (narwhale) tusk would be grouped with ivory carvings and fossil bones. 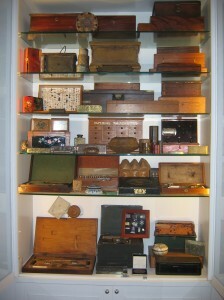 The smaller items would be housed in elaborately decorated multi-drawer collector’s cabinets. Part of the joy would be the marvelous way the contents could be spread out over, say, a hundred square feet when examined but then collapsed into the 2 foot square cabinet when all the many drawers were filled and the cabinet shut. Larger items on the other hand were unceremoniously hung from the walls or ceiling. The second period wunderkammern c1650 to 1780, on the other hand tended to be systematically grouped, using Linneus’ and other modern systems. And the items were displayed behind glass…letting you see it all at once, a less mystical and more rational form of presentation, for the age of reason was beginning. 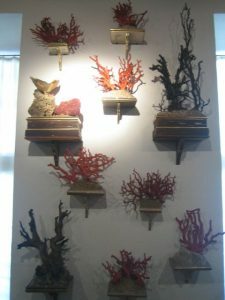 Natural wonders (Naturalia) might include actual specimens themselves, often from exotic locations: seashells, coral, stuffed or otherwise preserved specimens, pressed and dried plants, fossils and minerals. A related category was freaks of nature: sheep born with 2 heads, etc. Finally ethnographic tribal arts and crafts , e.g. feather headdresses, would land here. 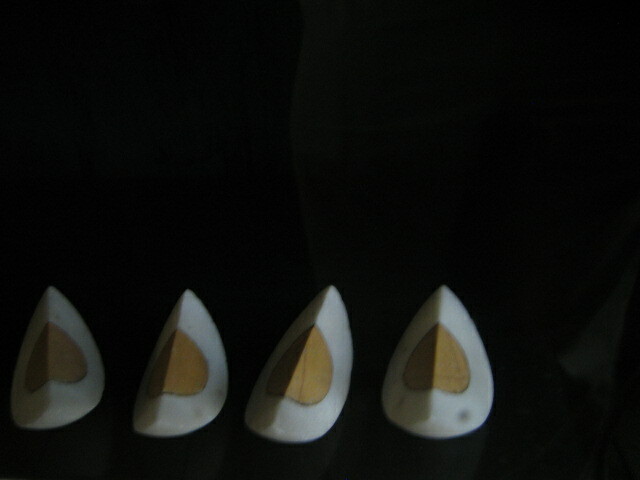 A) the extraordinary technique allowing the maker to accomplish the impossible, such as carving a walnut with the entire last supper scene, or paint a particularly realistic tromp L’oiel oil. B) the opulence of the material involved–whether valuable gems and gold or worked exotic materials, such as ivory, mother of pearl, rhinoceros horn, etc. C) the technological advance represented by the article–such as scientific instruments of great precision, and clocks, optics, etc. This category had the added renaissance appeal of providing mankind the ability to measure or otherwise control the forces of nature. In short was the owner a prince or a commoner, albeit a well heeled one such as an apothecary, a merchant or a clergyman? As we shall see, princes had the best financing, and often worked a statecraft agenda into their wunderkammern. To conspicuously consume, showing all the world how powerful you are. I submit that celebrating God’s greatness and inspiring wonder was a prominent undertone in all wunderkammern. But what else besides wonder does the founder want to inspire, fear or learning? 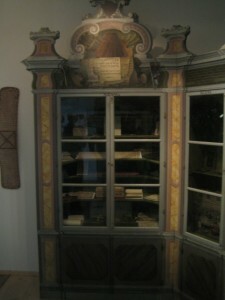 Athanasius Kircher (1602-80) built at the College of Jesuits in Rome a large wunderkammer, now mostly dismantled. Etched in its walls was the phrase, “whosoever perceives the chain that binds the world below to the world above will know the mysteries of nature and will achieve miracles”. (Mauries p34.) 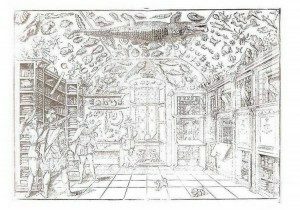 Professor Ulisse Aldrovandi (1522-1625) founded a wunderkammer of 20,000 objects in Bologna. “Collect, observe, compare”, he admonished and concluded, “nothing is sweeter than to know all things”. (Mauries,pp 148-150.) In fact it was often discussed that with a good library and wunderkammer, one might come to know in the span of a lifetime everything there was to know. 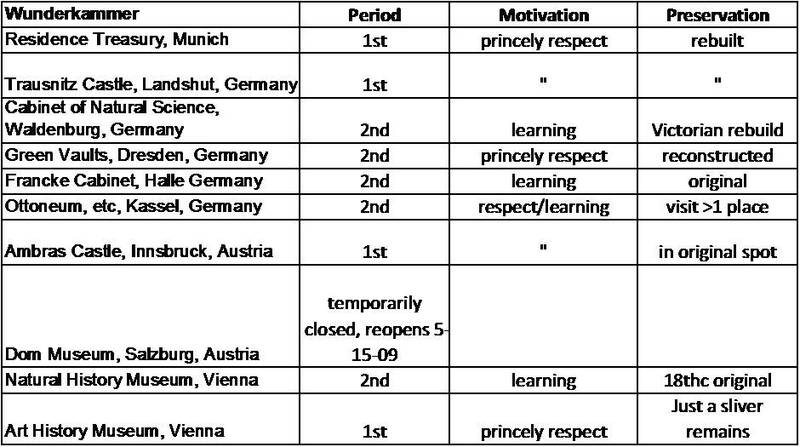 Clearly learning was important to many wunderkammerists. The result is that reconstruction of these wunderkammern has often been required. The good news is that the wunderkammern were generally very well documented by inventory listings and copiously illustrated catalogues produced by the founders, so accurate guides for rebuilding them are available. While the age, type and presentation format of these varied widely, we feel each one we visited was worth the effort, hands down. Each one will be handled in its own blog entry. Gems of the Green Vault of Dresden, Dirk Syndram (Leipzig,2005). Two of us made an 11-day expedition in April/May of 2009 to 9 wunderkammern (wonder chambers or cabinets of curiosities) of Germany and Austria for a cost of a little over US$4,000, including flights to Munich from Boston and all meals. The sites visited are not the only ones worth seeing but give a representative feel for those convenient to Munich or Vienna. We followed a 1600-mile loop northeast from Munich to Dresden, then west to Kassel, Germany, then south, over the Alps, to Innsbruck, Austria then east to Vienna, then northwest back to Munich for the flight back to Boston. Generally the 2 of us stayed in bed and breakfasts which though comfortable were not particularly expensive (about Euro$100/ night, double occupancy, usually including breakfast). We used John Wasson’s method of finding lodgings. We had no reservations. We simply drove to the center of town which is generally well marked (“zentrum” in German) and once in the center found a few bed and breakfasts, quickly selected one, asked for a room (which were generally available), and moved in. In the summer tourist season this method might be riskier and so for that reason a list of where we stayed and contact information is provided below. We found dinner spots the same way and ate well. We’d almost always walk the city after dinner which I’d highly recommend. I for one was glad most people spoke English. When planning a trip, bear in mind most museums including wunderkammern are closed Mondays. The exceptions are Ambros in Innsbruck (closed Tuesday vs Monday), the Green Vaults in Dresden and Trausnitz in Landshut, Germany which are open all days of the week. Winter schedules may well be different with more frequent closings. Check the wunderkammern websites (again listed below). Also it’s a good idea to pre-book a ticket on line for the Green Vaults. Also I used Mapquest for best routes and mileage estimates. 4-23-09 Lufthansa flight #425 Boston, MA to Munich, Germany, cost US$501 per person, round trip(flight #424 return trip). 4-24-09 Arrive Munich. Pick up rental car (Europcar, our cost for total trip about US$500) and drive to the city. Visit Residenzmuseum Schatzkammer, see my chapter 3 and their web site (ResidenzMuenchen@bsv.bayern.de). Drive about 50 miles (1 hour) to Landshut. Spend night at Stadthotel Herzog Ludwig (www.stadthotel-herzog-ludwig.de) for Euro$89. 4-25-09 In Landshut, visit Castle Trausnitz, see my chapter 4 and their web site (www.burg-trausnitz.de ). Drive about 250 miles to Waldenburg. Allow 3 hours for drive. We elect to stop en route at Zwickau in former East Germany, staying at Holiday Inn, Zwickau (hotel@hi-zwickau.de ) for Euro$109. 4-26-09 Finishing the drive to Waldenburg (where there are hotels but which we did not research) we visit Linck’s Naturalienkabinet, see my chapter 5 and their web site (www.museum-waldenburg.de ). Then drive about 70 miles to Dresden, a remarkable baroque city rebuilt after World War II bombing. We stay at Hotel Friedrichstadt, Dresden, see www.cafe-friedrichstadt.de, for Euro$112. 4-27-09 Visit Green Vaults (Grunes Gewolbe) both the New and Historic vaults. See my chapter 6 and their web site, www.skd-dresden.de/en/museen/gruenes gewoelbe.html. Must have reservation to visit historic vaults. Might get opening the day you visit but safer to make reservation in advance on line at their website at cost of Euro$6 per person even though non-refundable. New vaults require no reservation. You might consider staying over another night to see all the other Dresden museums which unlike the Green Vaults (open all days) are closed Mondays. 4-28-09 In Halle, visit Francke Foundation, see my chapter 7 and their web site, www.francke-halle.de . Then drive to Kassel, about 140 miles west, spending the night at Hotel Deuscher Hof, www.deutscher-hof.de , for Euro$87. 4-29-09 In Kassel, visit 3 separate museums, the Ottonium, the Orangiere, and the art museum to assemble the former wunderkammer in your mind. See my chapter 8. Then head south to Innsbruck, Austria, 400 miles and 6 hours driving time away. We choose to spend the night along the way in Wurzburg, staying at Hotel Amberger ,www.hotel-amberger.de, for Euro$98. 4-30-09 Finishing the unhurried drive through the Alps, we arrive at Innsbruck, Austria, staying at Hotel Central, www.central.co.at, for Euro$97. We enjoy a great café called Café Konditorei (at Schneeburggesse 3, Innsbruck, A-6020) serving cocktails, light meals and outstanding pastries. 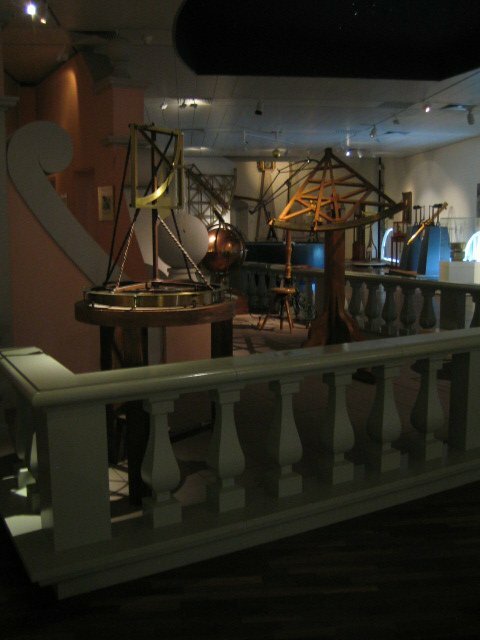 5-1-09 In Innsbruck, visit Schloss Ambras, See my chapter 9 and their web site, www.info.ambras@khm.at . Then head east for Vienna, 300 miles away, stopping after 100 miles in Salzburg. Here we stay at Hotel Neutor, www.neutor.at, for Euro$120, and walk to the nearby Old City for dinner. 5-2-09 In Salzburg, we confirmed the wunderkammer in the Dommuseum remains closed for renovations. It’s open now, see their web site, www.kirchen.net/dommuseum . Then complete drive to Vienna where we visit the 2 national museums, one dedicated to art history, Kunsthistorisches Museum, the other, natural history, Naturhistorisches Museum. See my chapter 10 and their web site, www.khm.at We recommend visiting one of these neighboring museum on this day, the other the next day. We lodge at Hotel-Pension Bleckmann, www.hotelbleckmann.at, for Euro$90. 5-3-09 Finishing the Vienna museum in the afternoon, we set out for Munich, some 270 miles and 4 hours away. En route, we stop at the historic city of Passau, staying at HotelGarni Herdegen, www.hotel-herdegen.de, for Euro$84. We walk the riverfront and nearby castle at night. 5-4-09 We arrive at the Munich airport and fly home. The wunderkammer of Bavarian Duke Albrecht V (1528-1579) was one of the grandest 1st period ones ever built. It housed over 3500 items and was installed over the ducal stables in several rooms, some of which were over 100 feet long (MacGregor, p13-15). Reportedly it consisted of both naturalia and artificialia, and according to contemporary expert, Samuel Quiccheburg, was arranged according to materials (ivory items grouped together, then wood items, etc) (Kenseth, p85). It was very much a microcosm of God’s world, and thus served as a suitable model for Quiccheburg to refer to in his important wunderkammerist’s manual of 1565. Unfortunately, it was over 95% destroyed by war and voluntary dispersal, and the only vestige today is the collection of precious materials retained by the Bavarian treasury. Fortunately, the items which do remain are well worth a visit. While the entire wunderkammer before dispersal may well have demonstrated a thirst for universal knowledge, the princely items which remain in the treasury certainly would have inspired the kind of respect and fear that must have favorably impacted Albrecht’s statecraft. 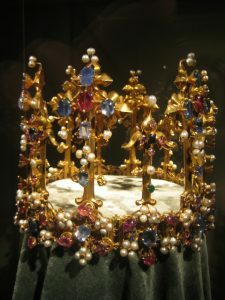 The earliest English Queen crown extant, made about 1575. 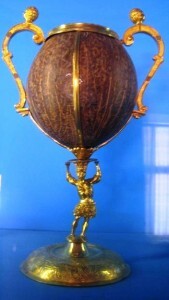 An early goblet, made of silver-and gold-mounted narwhale tusk with a cover of gold-mounted ostrich egg shell. 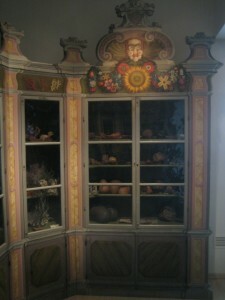 Dated c1530 it is indeed an early wunderkammer item, and shows the early fascination with the exotic. 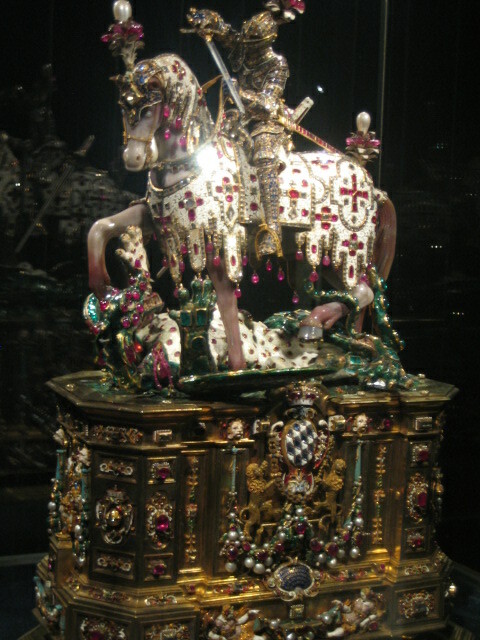 A spectacular enameled and jeweled gold and silver sculpture of St George and the Dragon. 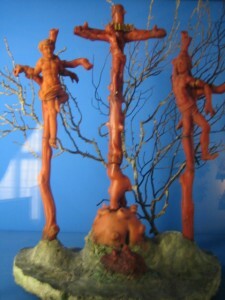 A tortoise shell crucifix, where the body of Christ is perfectly molded in tortoise shell by a method now lost and irreproducible. 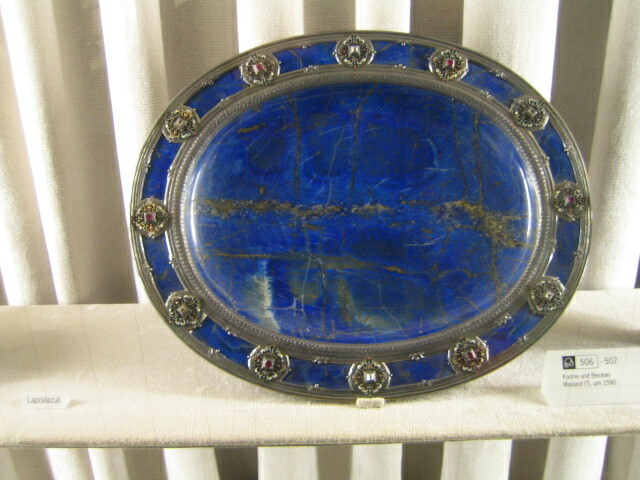 A lapis lazuli platter showing the collaboration of man and nature to create beauty, a commonly repeated wunderkammer theme. 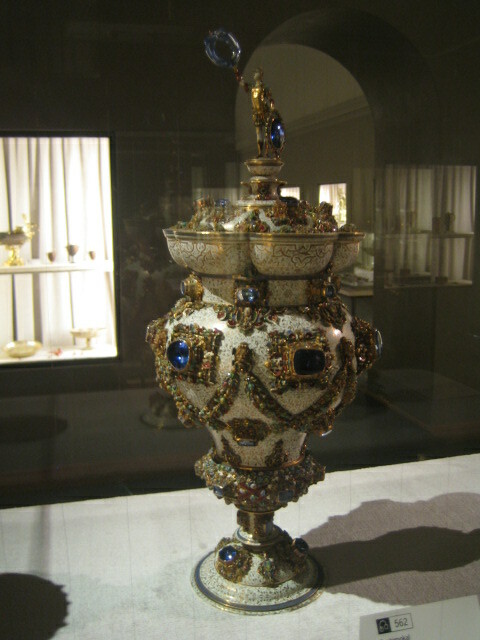 A white enameled and jeweled covered urn fabricated for Albrecht by a local Munich area goldsmith. 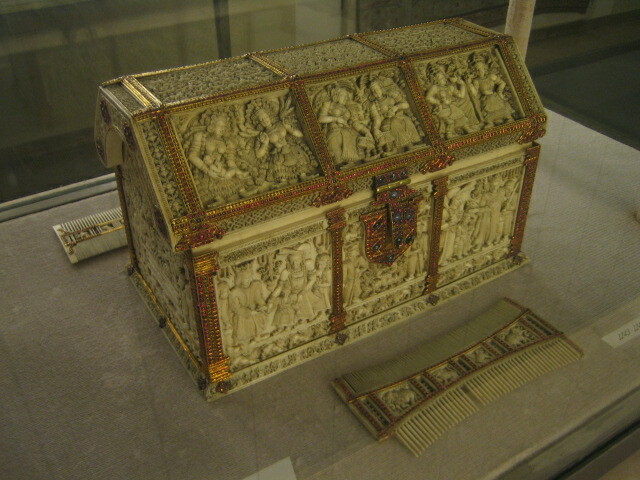 A carved 16th century ivory and ruby encrusted casket from Ceylon (Sri Lanka). Finally, an ancient Olmec jade mask from Central America incorporated into a seated figure by a 16th century European goldsmith. The treasury (schatzkammer) can be comfortably seen in an hour or so, but additional time should be set aside to view the large Residence Museum which houses it. This Residence was the seat of Bavaria’s ruling dynasty, the Wittelsbachs, until 1918. The address of the Munich Residence is Residenzstrasse 1, 80330 Munchen (Munich), and the web site, www.residenz-muenchen.de. The Age of the Marvelous, Joy Kenseth, (Hanover, NH, 1991). Curiosity and Enlightenment, Arthur MacGregor, (New Haven, CT, 2007). Installed in the 13th century Trausnitz Castle, overlooking the town of Landshut, about 50 miles northeast of Munich is the wunderkammer begun by the Bavarian Duke Wilhelm V (1548-1626), Duke Albrecht V’s son. 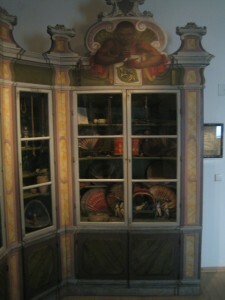 When Wilhelm assumed the title of duke in 1579, he moved his whole household including his collection to Munich, joining his wunderkammer with his father’s (see prior chapter). 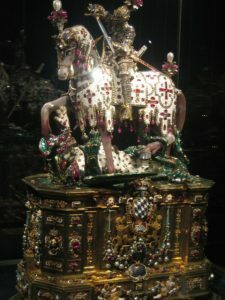 Interestingly in 1597 at the age of 47, Wilhelm turned over the government to his son, Maximillian, and thereafter until his death in 1626 led a life devoted to piety, asceticism, chastity, and the placid enjoyment of his collections of works of art and curiosities (Catholic Encyclopedia on line). The present collection has been rebuilt based upon archival records. The exhibits are split into 4 sections, naturalia, artificialia, the expected two plus two others, exotica, marvels from foreign lands, and scientifica, scientific tools and instruments. 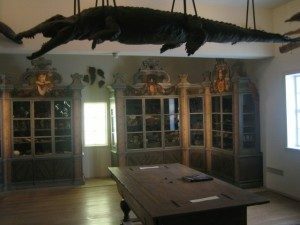 The naturalia room includes the iconic alligator hung upside-down from the ceiling, a huge elephant skull, etc, and also an attractive cabinet, the many drawers and compartments of which are presumably stuffed with natural wonders. So it is fitting that as these learned men turned to collecting they would use multidrawer cabinets, now fitted with doors vs. a fall front, to house their finds…while continuing to advertise subliminally their literary prowess. The Italian word for wunderkammer, studiolo, also congers up this literary reference. These collections existed, after all as Samuel Quiccheburg wrote, “so that through frequent perusal, you can rapidly, easily, and securely acquire new knowledge and great wisdom” (Trausnitz website). The author goes on to note (Laue, p27) that the cabinets permitted their owner to supply his visitor a guided tour where objects were removed from the cabinet and handed to the visitors. This “recovery from concealment” ritual enhanced the visitor’s sense of surprise and wonder. It also provided the owner a chance to exhibit his erudition. 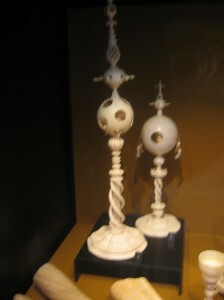 The artificialia section contains elaborate man-made turnings in ivory (below), demonstrating the artisan’s skill as does the ivory cabinet in the form of a building at the beginning of this chapter. 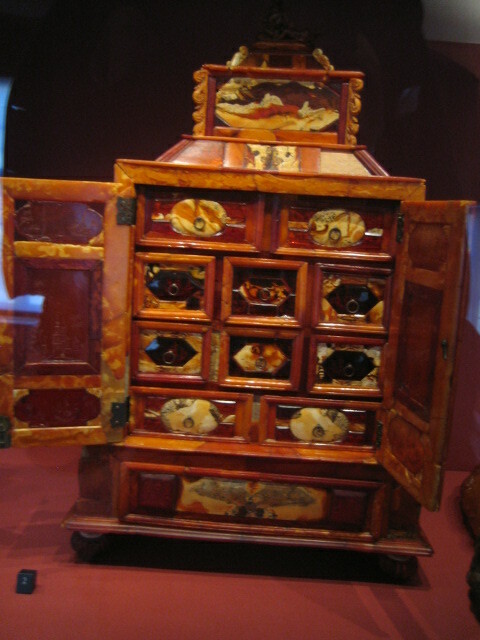 Similarly beautiful cabinets were built of amber and were often placed before a window to transfuse the light. 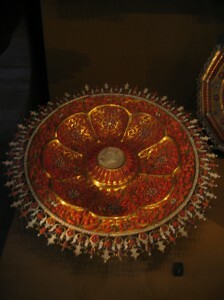 The exotic elements include sea shells and items made from mother of pearl. 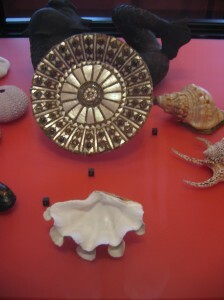 In this photo, a magnificent mother of pearl charger (large serving plate) is shown amid a shell collection. “Everything measurable should be measured,” was the renaissance refrain. (Trausnitz web site.) 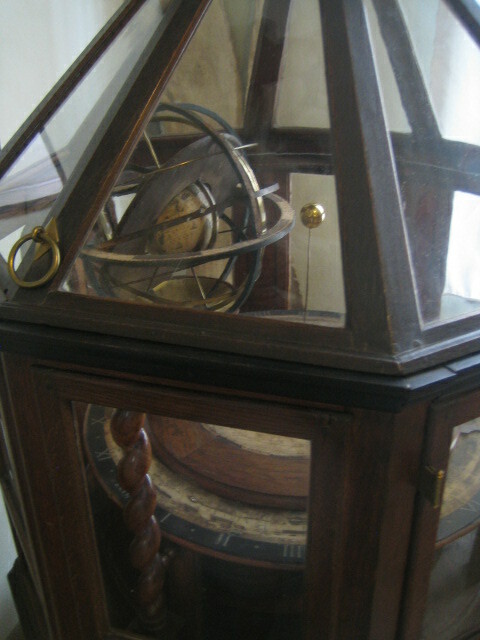 So clocks, astrolabes, compasses, etc, were all valuable to measure time, distance, the positions of the stars, etc. Measurement was how educated man could impose order over nature, and perhaps a reminder of the prince’s mandate to impose order over his subjects. While the collection was totally rebuilt from records in 2004, it is well done and worth a visit. An hour or so would be sufficient. (Web site www.schloesser.bayern.de. 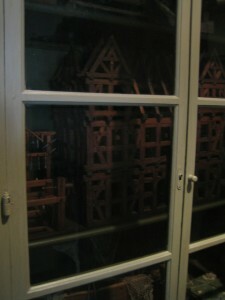 Then select Landshut from a list of museums; then select www.berg-trausnitz.de. Select English and finally Chamber of Art & Curiosities. Alternatively search for Trausnitz and you’ll get here.) The castle has been badly damaged and has also been thoroughly rebuilt. It too is worth a tour if one can be arranged in English. The town of Landshut is an attractive baroque one built around a charming river and boasts the tallest gothic tower built of brick in the world which is an amazing 421 feet (42 stories) tall. Furniture for European Kunstkammer, Georg Laue (Munich, 2008). About 3 hours by car northeast of Landshut (our last stopover) and say 4 to 5 hours from Munich is the little town of Waldenburg, Germany (formally, East Germany) which houses an appealing wunderkammer, the Cabinet of Natural Sciences. The wunderkammern discussed in the last two chapters in Munich and Landshut were both first-period (pre-1650) and princely. At the other end of the spectrum is this one. Began in the second period (post-1650), this systematically-presented collection was founded by commoners and focused almost exclusively on natural history. The wunderkammer was founded about 1670 by pharmacist Heinrich Linck (1638-1717) of Leipzig and added to by his son, Johann (1674-1734) also a pharmacist, and in turn by Johann’s son, Johann the Younger (1734-1807). Otto Victor I (1785-1859) prince of Schonburg-Waldenburg, purchased the Linck collection in 1841, moved it to its current location, and significantly added to it. It retains a Victorian character today and occupies over 9 rooms in a sea of glass cabinets. Freaks of nature were certainly of interest to the Lincks. 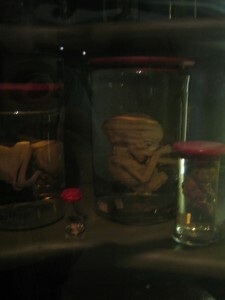 Here some stillborn babies with significant deformities are preserved in spirits, giving the term curiosity cabinet a new meaning. 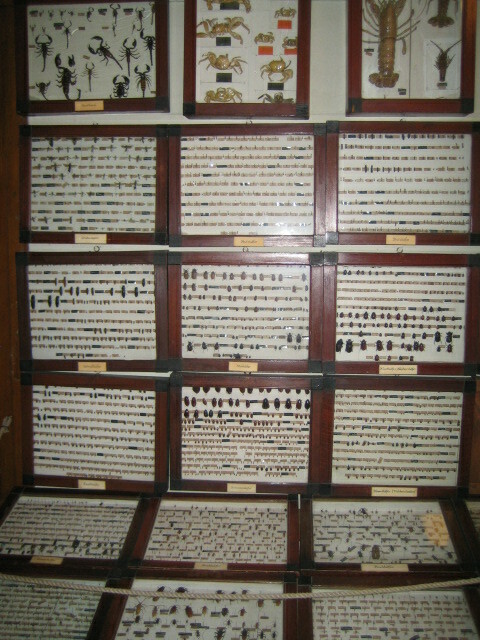 Similar samples as dry mounted specimens are also included. In addition to a large herbarium (2500 pages) of pressed leaves and flowers there is a cabinet filled with over 800 samples of woods of the world, showing the second-period systematic collector’s penchant for imposing order on nature. The scatter-shot approach of the first-period wunderkammer is not totally eliminated, however. 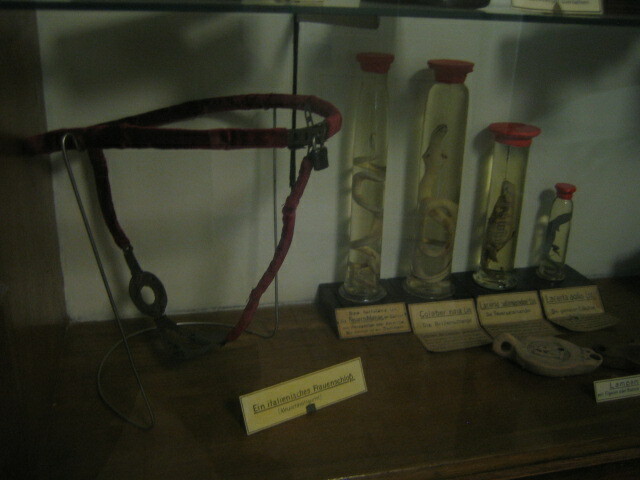 One cabinet cheerfully exhibits a medieval chastity belt (left) next to specimens in spirits of snakes and reptiles, in turn next to a Roman lamp. The scientific instrument collection of the Lincks’ includes an armillary c 1650 driven by a clock motor. There is an entire room of minerals and fossils. 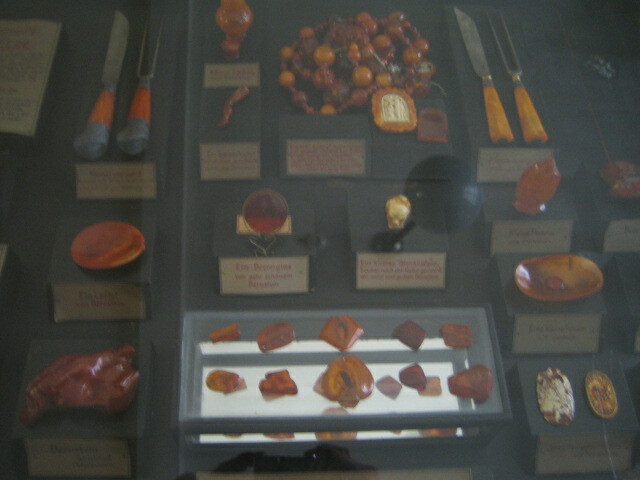 This collection includes a group of Baltic amber specimens, including, in turn, a collector’s ultimate nightmare: a fake. One piece of amber has a frog locked inside it, presumably one caught in the sticky pine sap which got fossilized along with the sap to make amber. Research now shows no frogs ever live in the Baltic during the amber-producing era, so we now know this to be a fake produced in the 18th century. (More on fakes and how to avoid them in a later chapter.) The fake is barely visible in the bottom center. 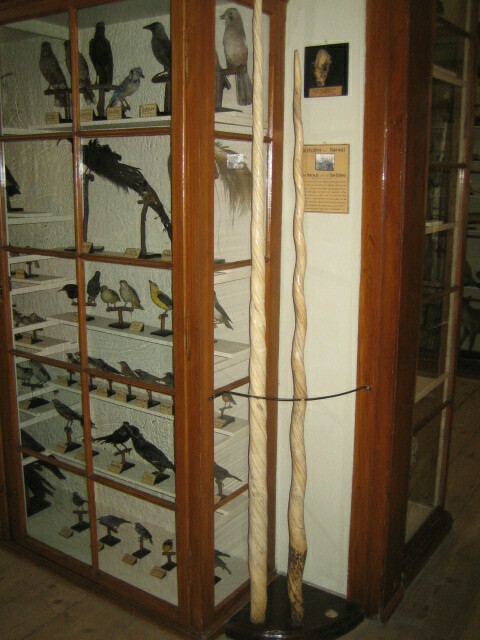 There is a large collection of stuffed birds, and here some are shown with some narwhale tusks. 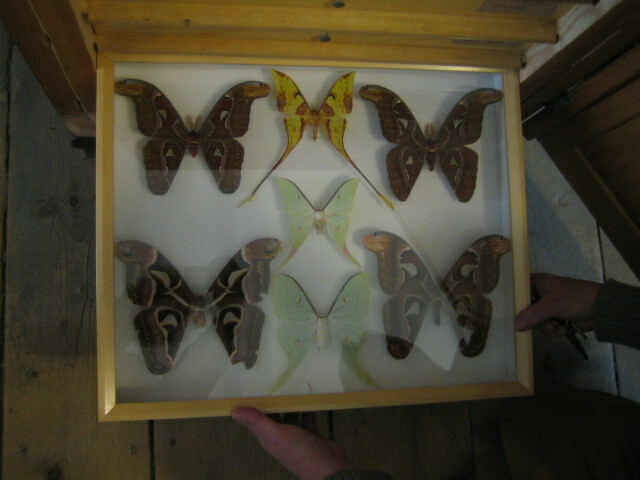 There is a large collection of crustasians, beetles and butterflies. 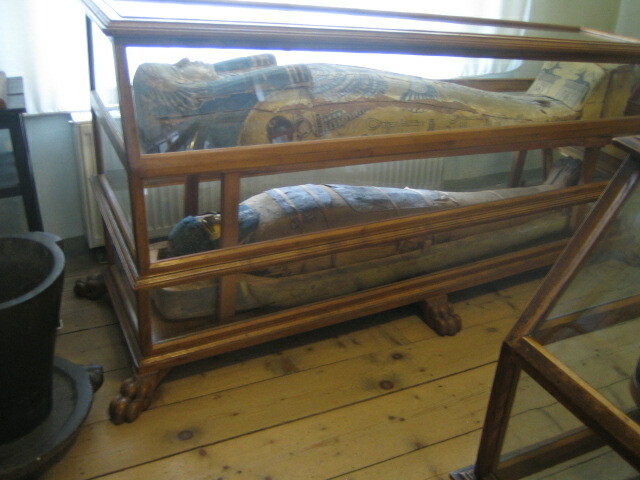 The products of ancient and exotic cultures were included, for instance an Egyptian mummy was added in 1845 by Prince Otto Victor I, as was a Chinese fancifully-carved ivory palace. The mineral collection includes beautiful pietra dura (stone inlay in stone slabs). And in case you didn’t know wunderkammerists had a sense of humor, the mineral collection includes a concretion which has been quartered like a boiled egg. This off-the-beaten-path wunderkammer feels as if it’s been undisturbed for the last 150 years. You feel you’re watching the early classifier and the early scientific mind at work, puzzling out what the relationships are that bind the world together. Although only an hour’s drive from our last stop, Waldenburg, the wunderkammern of Dresden are clearly in another world. Despite being firebombed to rubble by the Allies during World War II, Dresden has arisen from the ashes miraculously to its former baroque glory and today houses two, not one, over-the-top wunderkammern. The Historic Green Vaults were designed by Augustus II and opened (very selectively) to the public in 1730. 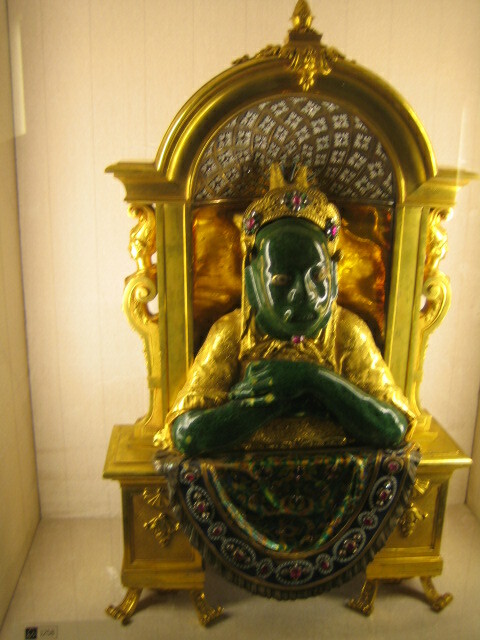 The New Green Vaults contain other princely assets originally housed elsewhere, plus items added after Augustus’s death in 1733. Together they represent Europe’s most magnificent treasury museum, and to the American mind, an embarrassment of riches. As suggested in chapter 2, these wunderkammern were a tool of state craft. Consider Augustus II, who was christened Augustus the Strong by historians a hundred years after his death possibly due in part to his physical strength but mostly due to his womanizing … he reportedly sired over 300 illegitimate children. He had visited Louis XIV of France a few years before becoming the Duke of Saxony in 1694. He craved the absolute kingship enjoyed by Louis and desired the same for Saxony and later for Poland which he got himself elected king of in 1697. Louis spent huge quantities of funds to validate and reinforce his absolute monarch status and Augustus did likewise. It was extraordinary that such a vast collection was ever assembled. Begun in 1560 by Augustus I as a more conventional wunderkammer with items of natural history and scientific instruments, it became more art and jewel oriented in subsequent generations, and then enjoyed spending like never before under Augustus the Strong, and his (only legitimate) son, Augustus III, again as reported in chapter 2. 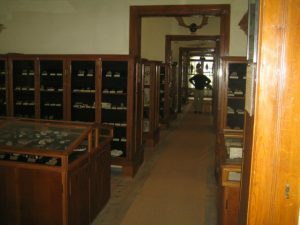 The natural history and scientific items were relegated to nearby collections to make room for the jewels. That almost all of this princely collection survived is even more extraordinary. One component of it, August the Strong’s silver service –including many 6-foot-high sterling urns and candlesticks and 3000 pieces in all—was melted down in 1772 and turned into thalers during a Saxon economic crisis (Syndram, Gems, p.10). But the rest survived, several times being boxed up and stored in the palace basement or in a remote mountain fortress, including during the firebombing of World War II. It was then taken to Russia in 1945 and then returned by the Russians to their East German allies in 1958. And then the historic Green Vaults building, badly damaged in the firebombing was totally refurbished and reopened in 2006 in its baroque glory as envisioned by Augustus the Strong. Unfortunately, photography is discouraged so many of the photos here are extracted from the Green Vault’s website or publications. 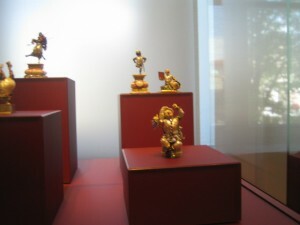 These small figurines are each in the form suggested by a huge, naturally-occurring and strangely-shaped pearl that make up the bulk of each sculpture. These and other items here illustrate several principles held dear by princely baroque wunderkammernists. The use of exotic materials in their natural state suggests collaboration between man and nature to form art. Virtuosic, practically impossible craftsmanship is utilized, and the skill level inspires wonder. The objects have no practical purpose. 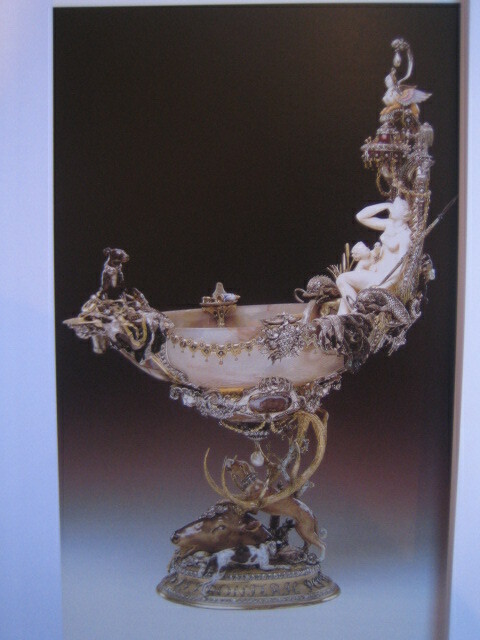 For instance, the bowl of Diana’s bath can’t hold liquids; it would leak where the base is attached. Objects instead were created to delight the beholder…and remind him of the status and power of the owner. This Bath of Diana bowl is made of chalcedony (semi-precious quartz) with a carved ivory Diana over a figural base cast in gold and silver. The entire work is encrusted in jewels. Augustus II purchased this 15-inch sculpture in 1704 from jeweler G. F. Dinglinger for 8000 thalers (Syndram, Art Treasury, p.17). 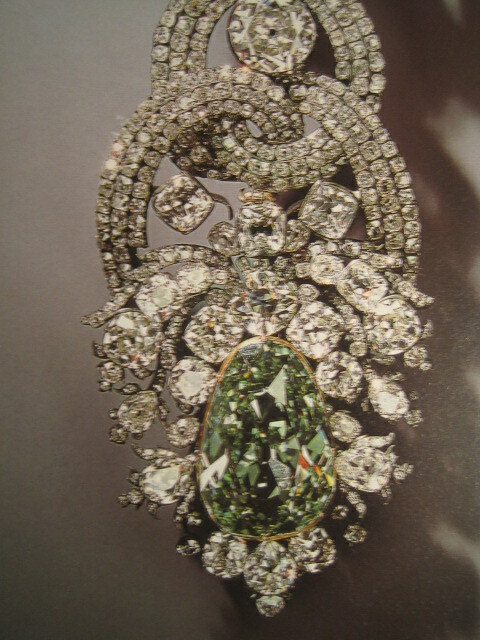 The 41 ct Dresden Green Diamond, bought by Augustus III for 400000 thalers in 1742, was later incorporated into a hat brim ornament. 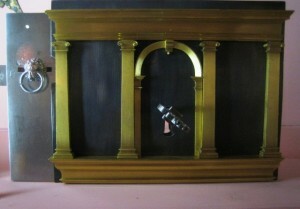 Even the boxes built to store the precious objects are themselves precious. Here are several leather-bound boxes, each built to house a unique shaped item. Here are several items made by Johann Frederick Bottger. This alchemist had two goals: convert lead to gold and convert various ground earths into porcelain. Using trickery he could appear to accomplish the first goal, but never of course did. He did in fact accomplish the second goal. His unsubstantiated claims and promises regarding the first goal caused him to become the dungeon-bound prisoner of August II. His success in achieving the second goal caused Augustus to make him a baron…though he remained a prisoner (Gleason, p119). Chinese porcelain, highly prized by Europeans, had eluded reproduction in Europe for 200 years, and the search for the formula in the late 17th/ early 18th centuries was on. 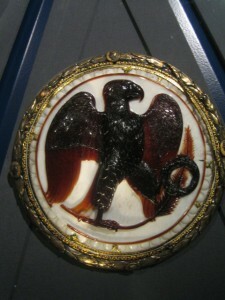 In 1708, after hundreds of high-heat experiments, including many using the Burning Glass discussed in the last chapter, and with the vital collaboration of a scholarly nobleman, E. W. von Tschirnhaus, Bottger succeeded in creating both red (shown here) and white porcelain for his captor, Augustus II (Gleeson, pp68-9). As a result the famous and lucrative Meissen porcelain factory was soon begun, yielding Augustus II over 900000 thalers of benefit during his reign (Gleeson, p194). Here over 4000 items are presented very much as they were in 1730 by Augustus the Strong, in 8 highly decorated rooms on shelves and tables generally with no museum glass separating you from the objects. These rooms are sequenced in a theatrical manner, gradually increasing in dramatic opulence. We start in the Amber Room. This highly valued Baltic fossil resin is a stone that both burns like coal and floats in water, and perhaps for these reasons is considered magical. 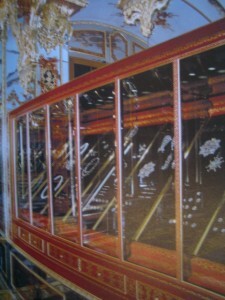 This cabinet on stand, almost entirely built of amber, was a gift of the Duke of Prussia in 1728. There are a number of other beautiful amber goblets and caskets and lesser objects as well. 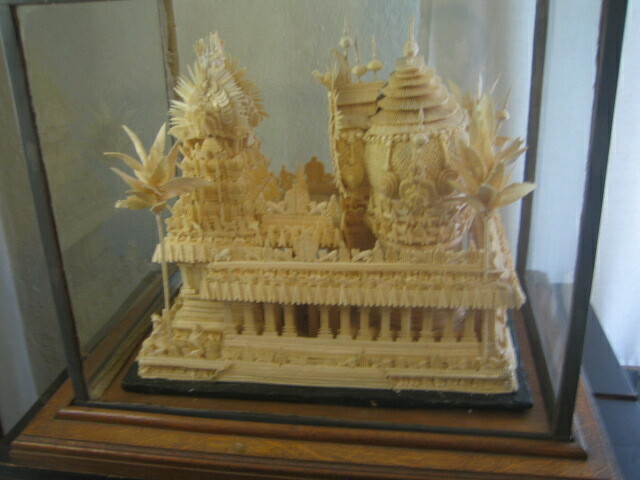 You next enter the Ivory Room filled with turned and carved ivory sculptures. From time to time the spectacular ivory frigate pictured at the beginning of this chapter has been on display in the Ivory Room, although now, probably for conservation reasons, is in the New Vaults. 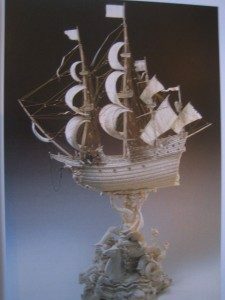 This 50-inch sculpture made in 1620 demonstrates what a great carver’s medium ivory is…the sails are each carved so thin as to be translucent. 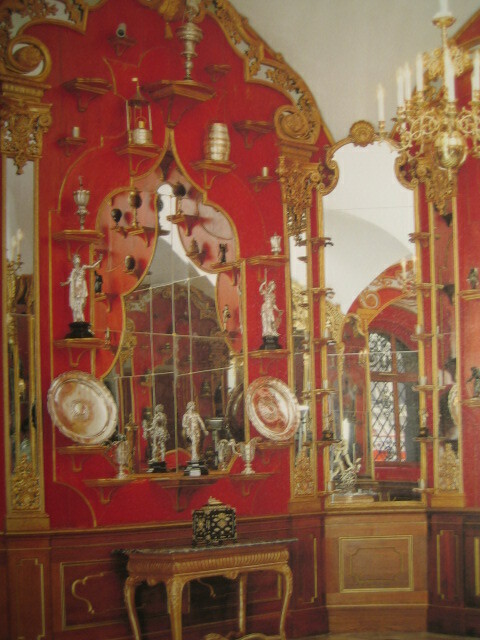 Then you enter the White Silver Room where the silver service of Augustus II once was and which is now filled with objects made of silver, wood, ivory, coconuts and other exotic materials, all presented against red walls. 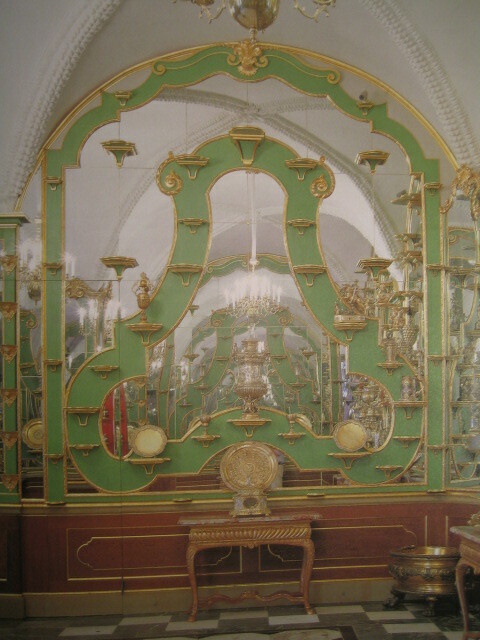 Then the Silver Gilt Room house silver articles with gold wash presented against green walls. 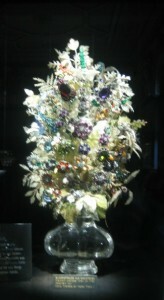 Then there is the Hall of Precious Objects with hundreds of sculptures of precious and semiprecious stones. Then you enter a rather plain room, the Coat of Arms Room, ornamented only by a series of brass plaques on the walls. There is no furniture and no valuable objects. This is the dramatic hesitation to heighten the climax. 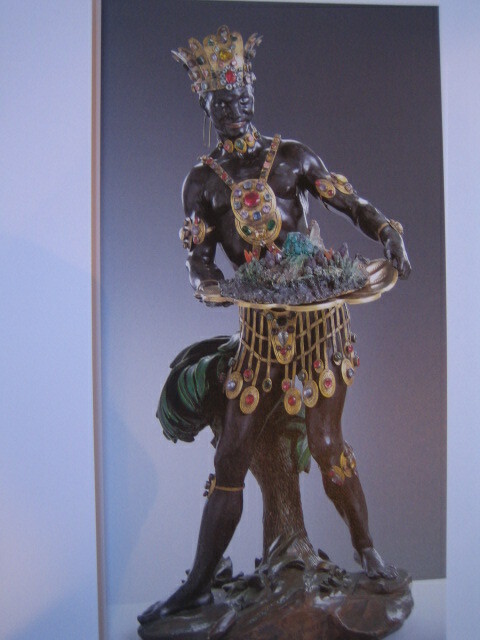 Then you enter the Jewel Room, where a pair of nearly 3-foot-tall, bejeweled “Moors” (one shown) greet you with their offerings of emeralds, etc, served on a platter. And then you are treated to a number of cases loaded with jewels. Here, unlike the rest of the Historic Vaults, glass cases are used, understandably separating you from the goods. This case is dedicated to rubies, the so-called ruby garniture. Other cases are dedicated to diamond, carnelian, tortoise-shell, sapphire and emerald garnitures. 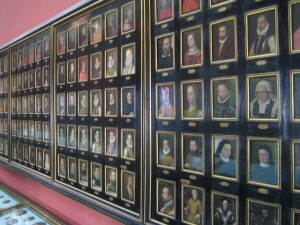 The cases have all been restored to their 1730 appearance as have all the appointments of the room. Finally you enter the last room, the Bronze Room, a smaller room with a display of fine bronzes, the muted tone of which provide sharp contrast to the glitter you just left. A tour through the Green Vaults was given the Duke of Prussia, a sometimes ally and sometimes enemy of Augustus II. This duke then wrote a certain Prince Leopold, “My father’s jewels are nothing compared to this” (Syndram et al, P18). No wunderkammer creator was as motivated by the need to inspire respect and fear. Mission accomplished, Augustus! I’d recommend at least half a day to see these two wunderkammern. You must buy tickets in advance for the Historic Green Vaults which reserve a specific time slot. No refunds will be given if you change times. You can buy these tickets on line at their website, www.skd-dresden.de. and select Grunes Gewolbe. The physical address is Residenzschloss, Taschenberg 2, D01067 Dresden. Nearby are a host of other museums, including the famous Zwinger which house an art museum, a porcelain museum, a museum of mathematical and scientific instruments and one of armor and minerals. I imagine a full day could be spent here. The Green Vaults are unique for being open on Mondays when most other museums are closed. Thus we scheduled our visit for Monday, glad to be making such a good use of an off day. But alas the Zwinger museums were all closed. Renaissance and Baroque Treasury Art The Green Vault in Dresden, Dirk Syndram, translated by Daniel Kletke, (Berlin, 2005). The Historic Grunes Gewolbe at Dreden The Baroque Treasury, Dirk Syndram, Jutta Kappel, and Ulrike Weinhold, translated by Ulrich Boltz and Dr. Richard Gary Hooton, (Berlin, 2008). The Arcanum, Janet Gleeson, (NY,1998). Halle is about a 1 ½ hours’ drive northwest of Dresden. This is the home of the Francke Foundation and its cabinet of curiosities and artifacts. 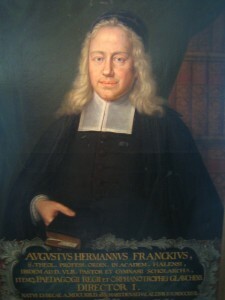 Founded in 1698 by Lutheran theologian and educator August Herman Francke (1663-1727), the Foundation was first and foremost an orphanage and secondly a progressive school for all social classes. 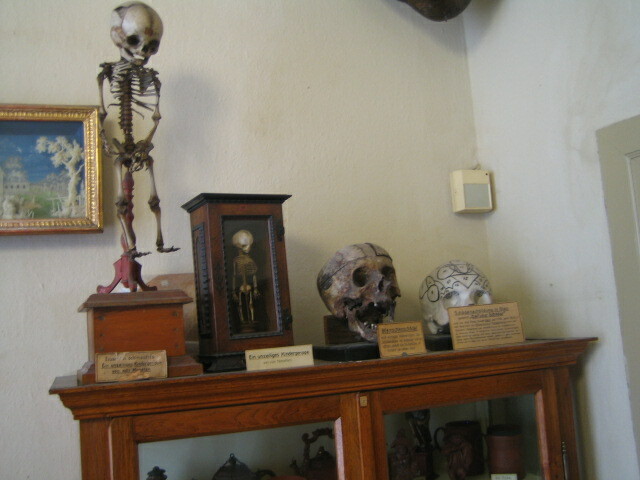 Thus Francke formed the wunderkammer as a teaching tool. Francke was obviously an effective fundraiser for not only did he raise the money to build the substantial Foundation but also induced people worldwide to provide as gifts most of the almost 5000 items of the collection. 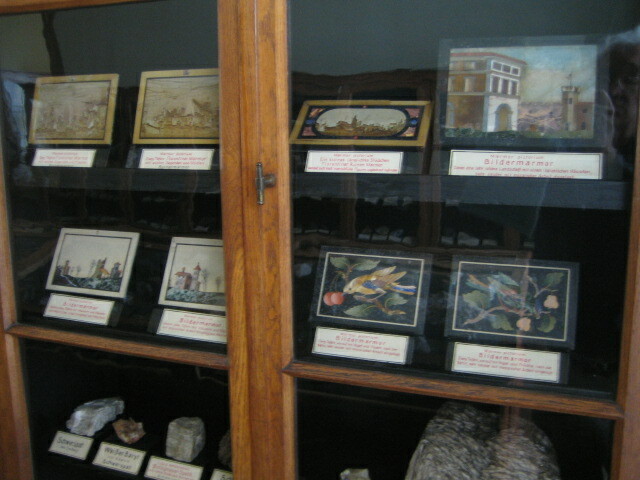 A decade after this kindly-looking gentleman’s death, a local artist and naturalist, Gottfried August Grundler (1710-1775), began to reorganize the jumble systematically and create a group of 16 individual cabinets, one for each category, and each one beautifully painted to communicate the theme. 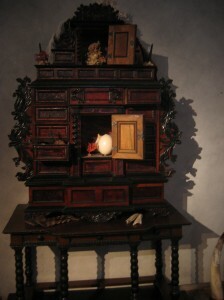 The result is a second period systematically organized wunderkammer presented behind the very glass cabinets created for them in the 1730’3 and 1740’s. Surviving the wars in tact , the wunderkammer was then threatened for a while in the East German era by leaky roofs and other deferred maintenance, thus some restoration was done in the early 1990’s. This was done closely referring to Grundler’s original documents, placing all cabinets in their original position in the orphanage attic. 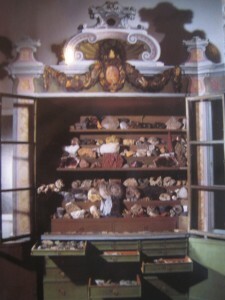 Thus today we have an excellently preserved example of a well-sponsored, middle-class baroque wunderkammer, which one author calls “perhaps the most complete survivor of a cabinet of curiosities” (Mauries,p 25-7) The natural history is concentrated at one end, and the man-made artificialia at the other. Here the minerals and petrifactions (fossils) are presented in a case the crest of which is painted with a garland of rocks and crystals. This collection was donated in part by an influential father of a student (Bahlke, p4). Other components were sent by fellow Pietists, believers in that form of Lutheranism Francke preached. 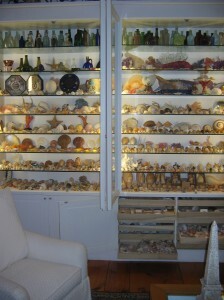 Nearby (not shown) is a similar cabinet of sea shells. 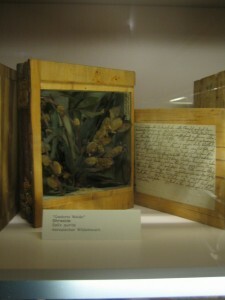 The plants case, painted with floral garlands and a face composed of plant parts (after Giuseppe Arcimboldo, 1527-1593) houses exotic seed pods, nuts, dried fruits, branches, roots and leaves. The animal kingdom cabinet is painted with a garland of frogs, bats and butterflies all of which is surmounted with a grinning leopard. 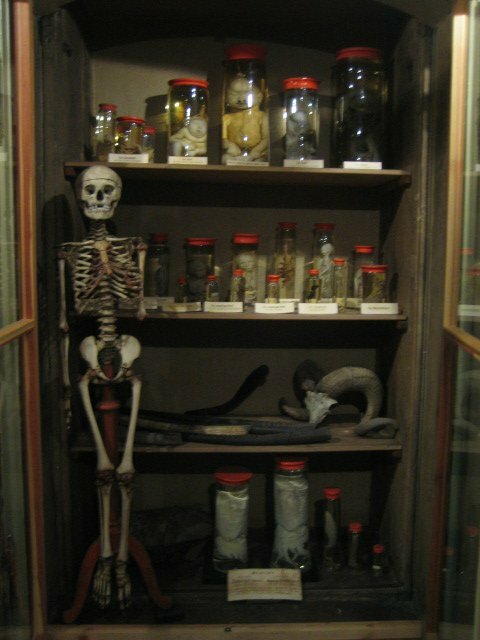 The animal cabinet houses a number of specimens preserved in spirits such as the eerie group of fetuses, reminiscent of the presentation in Waldenburg (Chapter 5). 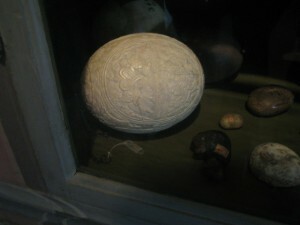 There is also an egg collection, some of which was donated by the elector of Brandenburg, straight from his wunderkanmmer. 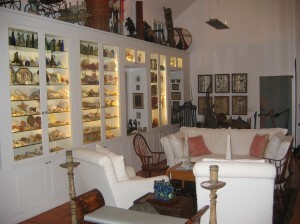 The artificialia end of the large room contains a case with artifacts from India, painted with a native from that subcontinent, and another case for Borneo. The contents were provided by fellow Pietist missionaries stationed in those remote areas. Another cabinet was reserved for manuscripts and writing instruments of the world, its crest painted with 25 specimens of different alphabets and scripts. The written word was particularly important to Pietists as the one pure form of communication, versus pictures, paintings, theatre, and music, all of which were a tad too worldly and decadent for their tastes (Bahlke, p19). 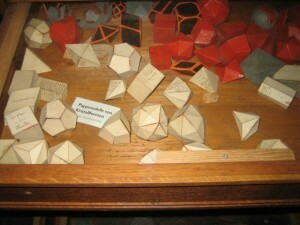 Another section is dedicated to a collection of conception models or mechanical models. 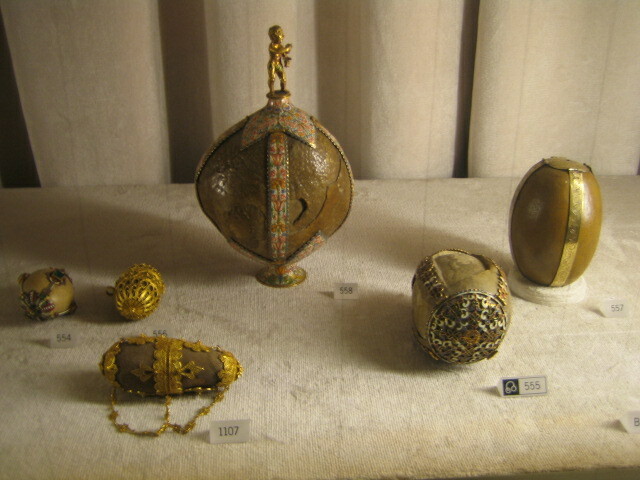 A nearby cabinet (not shown) holds holy items from other religions, another, fine art, another, clothing of the world, and another, a collection of masks and coins. The middle of the room contains oversized specimens, including at the natural history end the obligatory crocodile (see photo at the start of this chapter), huge whale bones, python skins, etc, and at the man-made end, an Eskimo kayak, exotic and medieval armor, etc. Finally the center of the room is dominated by globes, models of the planetary system and universe. 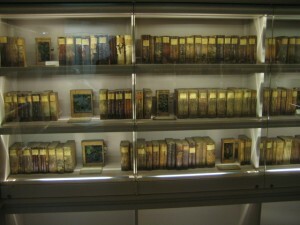 While the classification of this collection feels somewhat modern (after all, its designer Grundler paid for translating Linneus’s Systema Natura into German), the scope of the collection is universal or encyclopedic, consistent with a wunderkammer goal of creating a microcosm of God’s entire universe in one room. One of the more authentic and untouched wunderkammern, the Halle wonder chamber is definitely worth a visit. Bring a flashlight because the contents of the cases are sometimes shaded by the glass doors. We were lucky enough to receive a fascinating guided tour by Dr. Claus Veltmann, the curator. The booklet published by the Francke Foundation noted as a reference below as translated into English also provides a great guide…be sure to ask for one if not available in the bookstore. An hour and a half is sufficient to see the wunderkammer and I’d also recommend viewing Francke’s nearby library of 35,000 books as well as the Foundation grounds which also serves the local university. The address is Francenplatz 1, 06110 Halle and the web site www.francke-halle.de. Kassel is about 2 hours east of Halle by car. Here the noble family, the Landgraves of Hessen-Kassel, presided over a prosperous community for centuries and, not surprisingly, reflected their good fortune in the family wonder chamber. Their collection was begun by Landgrave Wilhelm “the Wise” (Wilhelm IV who died 1597), continued by his son, Moritz “the Learned” (died 1627), and his descendant Karl in the late 17th century. And in the 1770’s, Landgrave Frederich II sponsored one of the first museums open to the public. Unfortunately the princely wunderkammer no longer exists, but many of the items remain in the city distributed among the museums there. Thus you must assemble the wunderkammer in your mind by visiting the Ottonium for natural history, the nearby Orangery for scientific instruments and the kunstkammer for art. 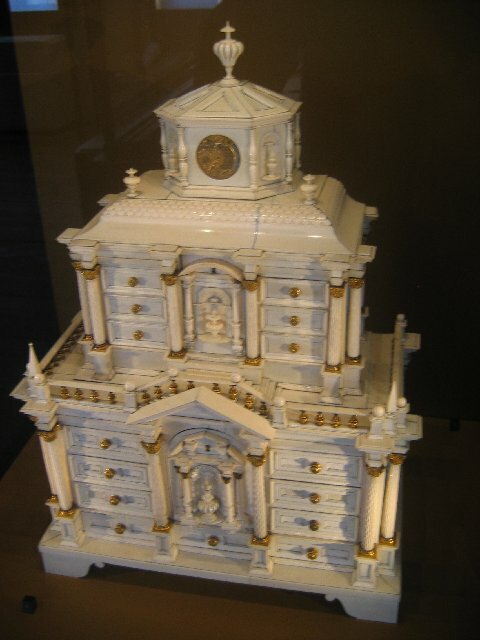 Built under Landgrave Moritz about 1600 and made over with a baroque look about 1700 by Landgrave Karl, the Ottonium housed the entire chamber of curiosities and observatory. Later the art and other artificialia was move out leaving only the natural history which was more recently incorporated into a modern nature museum. A good portion of the first floor exhibits the Landgraves’ naturalia from the 16th through 18th centuries. One of the most wondrous elements is Scheldbach’s “wood library”, consisting of over 500 “books” and representing 441 species of woody trees and shrubs. Carl Scheldbach was the Landgraves park administrator in the late 18th century and built this library in his spare time. Catherine the Great of Russia tried to purchase this library for her wunderkammer for 2,000 thalers, but the Landgrave was able to keep it in Kassel. A large cabinet of rocks and minerals also contains a collection of models of various crystal shapes, each painstakingly made of paper. 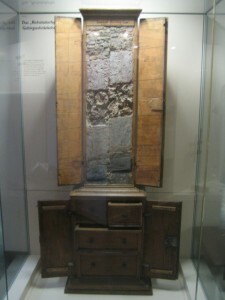 A copper miners’ group gave this cabinet built around a slab of naturally-occurring rock strata to the Landgrave at the end of the 18th century. 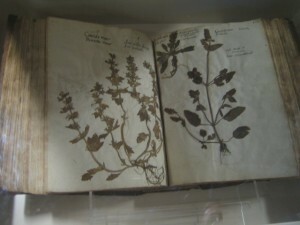 The collection also contains a large 16th century herbarium, one of the earliest in Europe. A ten-minute walk away, a superb collection of scientific instruments is housed in the Landgraves’ former Orangery (an elaborate greenhouse for growing oranges). Wilhelm the Wise was an accomplished astronomer and mathematician and personally used many of the instruments here to make celestial observations and help chart the heavens. Wilhelm was also keenly interested in clocks, maintaining a sizable collection, and calibrated them to his celestial observations. 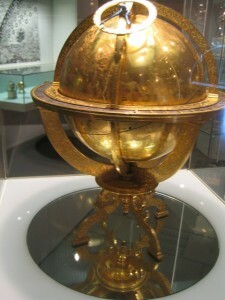 At the beginning of the chapter is one of Wilhelm’s fine brass globes, made in the late 16th century. It is interesting that so much navigational and astronomical study was done by a land-locked prince with no navy or shipping. Again we see an illustration of the importance to the renaissance prince of measuring nature, the first step towards controlling it. 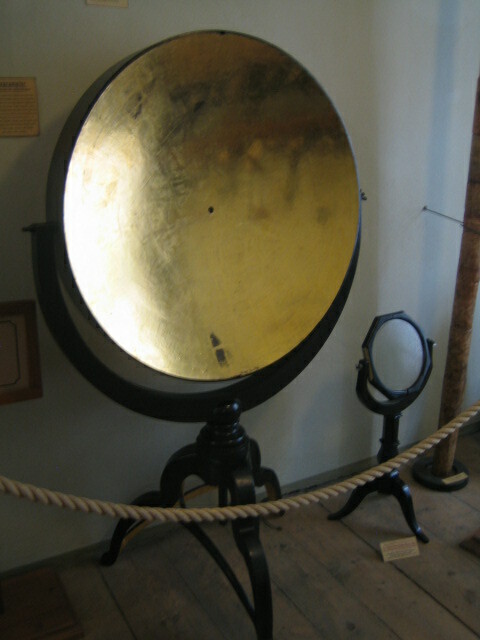 Here is another measuring tool, the hygroscope, purporting to measure humidity. 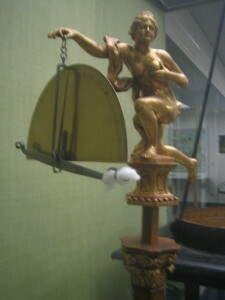 The moister the air, the wetter the cotton ball at on end of the balance, and the needle would move. The accuracy was not great but the artistry was. 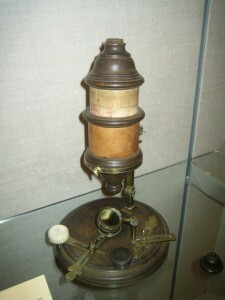 Here is a microscope made by Englishman Robert Hooke (1635-1703). Although Galileo invented the microscope, Hooke improved it and was the first really to use it to publish results…for instance, he was the one to coin the word “cell” to describe the building block of life…thus Hooke is known as the father of microscopy. The microscope revealed whole new worlds right under your nose and was a wunderkammer favorite. 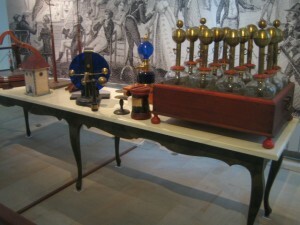 Here is a table full of 18th century electrical experimental equipment also added during Karl’s rule. Landgrave Karl founded the Collegium Carolinum in 1709 which soon became a center of scientific investigation (Ottonium web site). A 20-minute bus ride across town takes you to the kunstkammer housed in the elegant baroque schloss situated, in turn, on beautifully landscaped grounds. The art collection house here, particularly for old masters, is staggering. 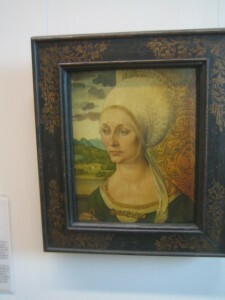 Here is the famous painting of Elsabeth Tucker by Albrecht Durer in 1499. There are 2 large rooms full of Rembrandt’s alone, worth hundreds of millions of dollars, I suspect. 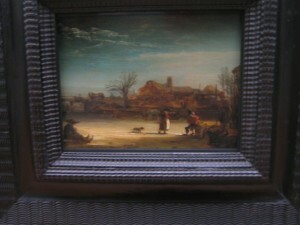 I noticed one small impressionistic one of a winter scene and learned the great master would do quick sketches, in this case outside in winter, before commencing a major work. 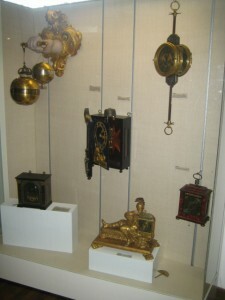 Some of this collection began in the Ottonium, was moved by Landgrave Frederich to the Fridericianum in the 1770’s when that museum was opened to the public, and then moved here. I probably should have worked to tease out what part of this collection was original to the wunderkammer, but instead I was just let myself be overwhelmed by how extraordinary the collection was. I’d recommend an hour or so for each of the Ottonium and the Orangery, and a few hours at the Schloss Kunstkammer, say the better part of a day for it all. Though there is really no wunderkammer in Kassel, there is a lot to wonder at! Start by visiting the Ottonium web site at www.naturkundemuseum-kassel.de. About 6 hours south of Kassel, and on the other side of the Alps is the beautiful city of Innsbruck, Austria, surrounded by snow-capped mountains, and nestled in a lush green valley ablaze, in early May, with the cherry and lilac blossoms. It is here that Hapsburg Archduke Ferdinand II (1529-1595) moved to in 1564, converting a gothic castle into a Renaissance palace, and here that one of the most satisfying wunderkammern can be seen today. 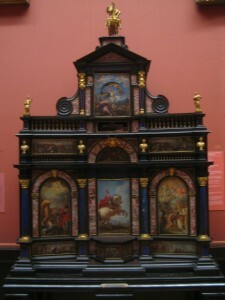 It is exhibited in the same place and in much the same manner as was first installed by Ferdinand in the 1560’s. Ferdinand’s father, uncle and older brother were each Holy Roman Emperors. His uncle, Charles V (1500-1558) was perhaps the best known and most powerful Holy Roman Emperor of all times, and the empire then included Austria, Hungary, upper Italy, the Netherlands, and Spain. So Ferdinand II had plenty of money and plenty of free time and he put both to good use in assembling one of the most famous wunderkammern of his time. Though it was sold for a fortune by his son about 1600 to Emperor Rudolf II (1552-1612) and was then temporarily moved twice to avoid the devastation of war (during the Napoleonic era and World War II), this collection has remained quite in tact. And what we see today is quite similar to what Ferdinand left behind. His plan (and the one used today) was to group items based upon the materials they were composed of, and place each group in its own floor-to-ceiling case, where the background color was chosen to show that group to best advantage. 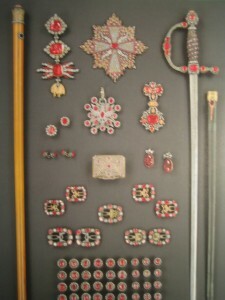 Thus the goldsmith items were presented against a blue background, the wood against red, the stone against green, etc. The goldsmith items usually were natural items of great rarity set in gold settings. 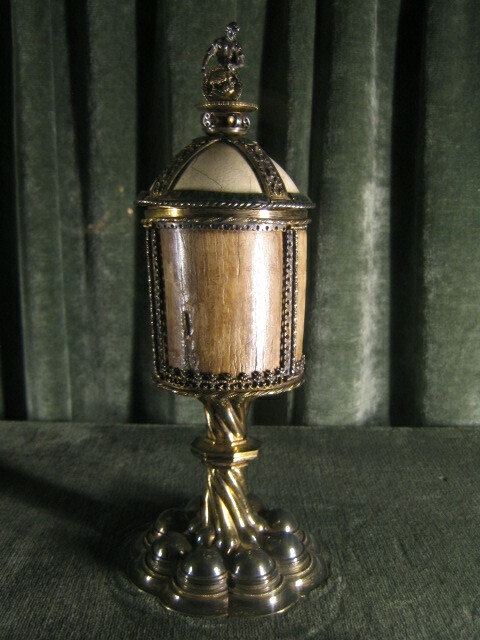 For instance, here is a coconut shell, a rare and wondrous item in the 1560’s and one reputed to have magical healing properties, mounted as a chalice with gold base, handles and ornamentation. The blue, as selected by Ferdinand, sets off the gold work nicely. 18 such cases were placed in the middle of this large room back to back in rows of 9, and the walls and ceiling at the perimeter were richly hung with paintings and oversized items (Auer et al, p 30). The collection was encyclopedic, and the scope as broad as possible with naturalia and artificialia from all fields of knowledge. 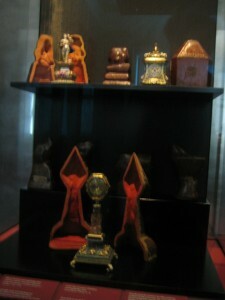 And the various collections were presented side by side with the gold and treasury items to underscore the idea that all of God’s works were of equal value. 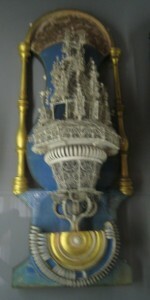 The categories included many predictable ones for a princely wunderkammer, goldsmith works, stone works, instruments (scientific as well as musical), bronzes, and exotica such as ivory and mother of pearl works, but then also ones of particular interest to Ferdinand, such as hand stones, coral, wood turnings produced by his turnery, glass, including that executed by his own glassworks, and natural history. Hand stones were bizarrely shaped rocks and minerals sized to fit your palm that were then trimmed with tiny gold and silver figurines. 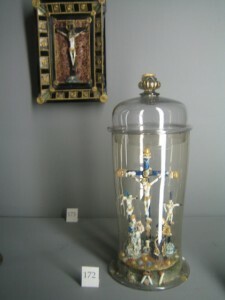 Here a porous mineral specimen has had its niches filled with gold support columns and subterranean human figures, all surmounted by Christ’s crucifixion. Ferdinand II owned the world’s most important collection of hand stones of his time (Auer et al, p36).Here is another hand stone where the natural specimen seems to be white coral. Biblical figures rest about its base while one of their numbers receives a visitation by an angel, who you can see atop the coral column. This is a particularly beautiful object. Coral was richly represented. 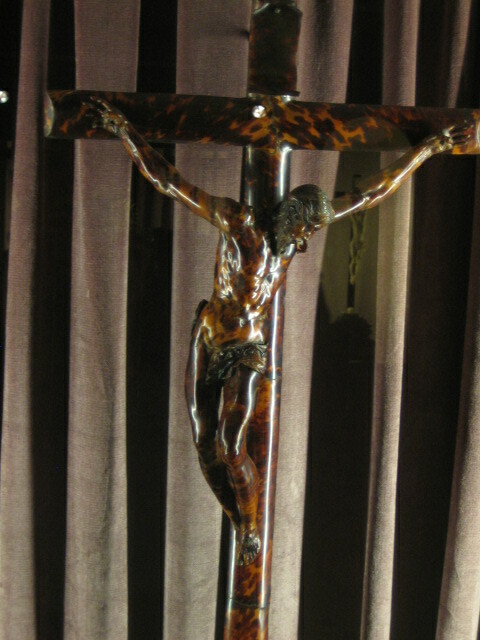 Here a collection of a wide variety was mounted on bases, and at the beginning of this chapter, naturalistic coral had sections carved in the image of Christ’s crucifixion. 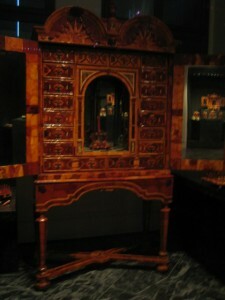 Wood was elevated by being so skillfully turned and filigreed often by Ferdinand’s own turners. See the detail of a large Tirol sepulcher c1575 as well as a similar work in ivory. This glass works also produced glass images. 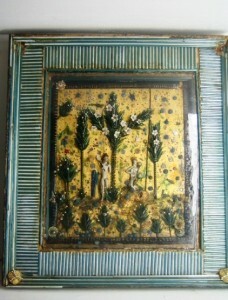 This example shows an image of Adam and Eve on paper sprinkled with powdered glass and featuring glass trees and figures. The bold architectural design of this brass and iron lock shows that base metal works deserve inclusion in the wunderkammer. Mandrake roots naturally occur in the rough shape of the human form and so were valued for their alleged magical properties. This mandrake root looks like a crucifix and would have been doubly prized as an example of mirabilia, an object demonstrating a miracle. And just plain bizarre: here is a pair of leather boots from the mid 16th century where the toes are individually sheathed like gloved fingers. The walls and ceiling at the perimeter of the room are here hung with a 16th century taxidermist’s shark lurking among other naturalia. 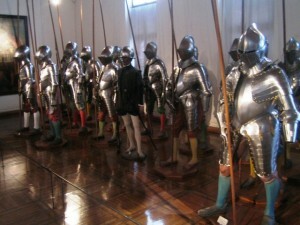 The adjacent 3 rooms house Ferdinand’s collection of knightly armor and Renaissance military weaponry. In 1564 he had 17 tons of armor transported to Ambras. The knightly material give witness to how important jousting was as a form of courtly entertainment in Ferdinand’s time, while the military material reminds us of how conscious the Hapsburgs were of the nearby threat of the Turks who occupied Eastern Europe. Ambras is not to be missed. I’d recommend most of a day for the armory, wunderkammer, and the impressive portrait gallery in the main palace (see info.ambras@khm.at.) After your visit, I cannot recommend strongly enough a trip across town to Cafe Konditorei (Schneeburggasse 3, A-6020 Innsbruck) for pastry. They offer a wide choice of the best pastry I have ever tasted as well as light meals and cocktails. Ambras Castle, Alfred Auer, Veronika Sandbicher, KarlSchutz, and Christian Beauford-Spontin, Translated by John Winbigler, (Vienna, 2000). Vienna is about 300 miles (5 hour’s drive time) east of Innsbruck. About 100 miles into the trip you will pass through Salzburg, home of the Dommuseum. Located in the dome of the cathedral, simply called Dom, this wunderkammer was founded in the late 17th century by the archbishop of Salzburg. Unfortunately this was closed for renovations during our May, 2009 passage but has since been reopened, and my research indicated it my well be worth a visit. Vienna, of course, is a cultural hub. We focused on two national museums situated in two imposing baroque and vitually identical buildings facing each other across an open mall, the Natural History Museum and the Art History Museum. The parallel architecture and placement of these museums suggest that art and natural history are equally important, a familiar wunderkammer theme. These are two vibrant modern museums, but each has chunks of their founding wunderkammern collections present. The Art History Museum contains an in-tact sliver of Rudolf II’s massive wunderkammer. Rudolf II (1552-1612), became Holy Roman Emperor in 1576 upon the death of his Hapsburg father Maximillian II. He moved himself, his collections and his government to Prague in 1583 to Hradcany castle, the world’s largest castle, and there built the world’s largest wunderkammer, including “everything rich and strange”. Rudolf was given to depression/ melancholy. His kingdom was dominated by struggles between Catholics and Protestants and it seems he withdrew more and more from public life to his collections. Rudolf possessed a wunderkammer which was a complete microcosm of the world symbolizing that he was master of the world (Kenseth, p85). And clearly he found this microcosm a more reassuring place than his fractious court where plots to depose him became increasingly common. Relaxing his claim on absolute power somewhat, he was able to keep his crown and (perhaps more importantly to him) maintain a network of agents worldwide to search out wonders for his collection. You might recall from Chapter 9 he bought the entire Ambras collection in 1600. But upon his death in 1612 his collection was scattered and only a small grouping of his antiquities remained in tact as a collection. 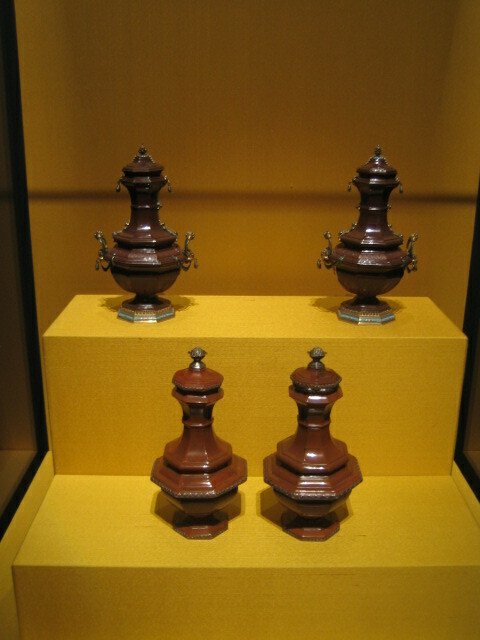 This collection was eventually brought to Vienna. 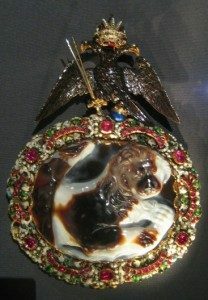 Here is a classical carved Roman eagle in agate, and at the beginning of this chapter is another ancient agate cameo in a jewel mount surmounted by the Hapsburg eagle commissioned by Rudolf. 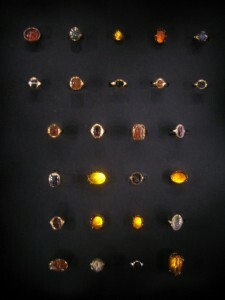 Here is a collection of ancient signet rings attractively back lit. 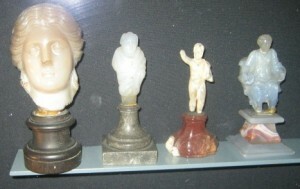 Rudolf’s collection also includes ancient statuary. 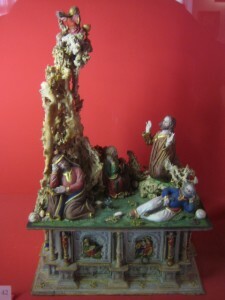 Elsewhere in the museum are other elements of Rudolf’s collection such as this collection of miniature painting on ivory of Hapsburg family members created for the Ambras wunderkammer and bought as part of that purchase in 1600. 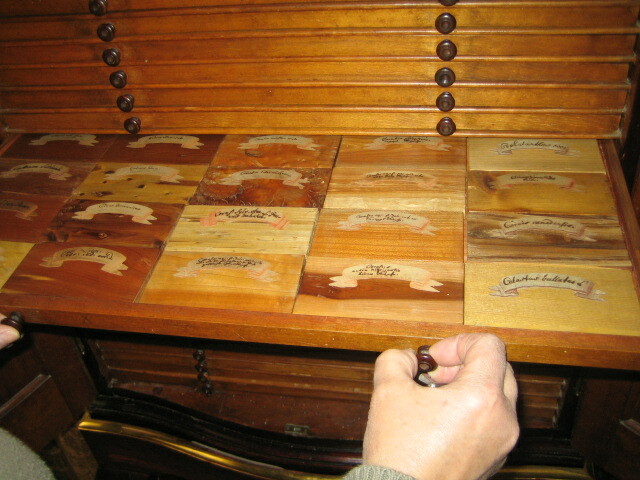 Similarly here is a cabinet of the type Rudolf used to house parts of his vast collection. 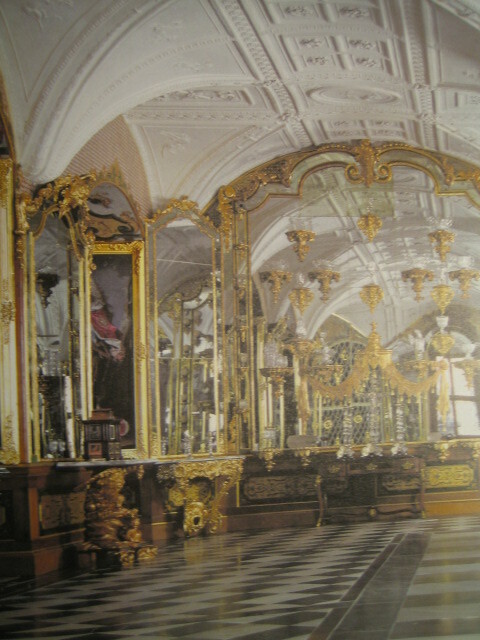 The general collection has two painting while not Rudolf’s are very typical of the wonder chamber. This work, a self portrait by Parmigianno (1505-1540), demonstrates the highest tromp l’oeil (trick of the eye) skills. 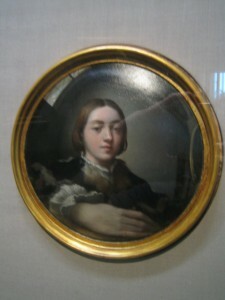 The painting appears to be on a convex silvered surface but is in fact rendered on a flat canvas. All the curvature optics are faux. The degree of difficulty is high, the virtuosity extreme and the effect truly wondrous. 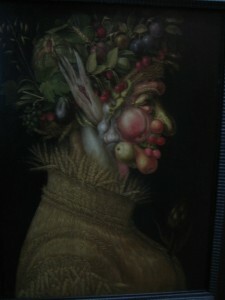 This vegetable face by G. Arcemboldo, c1563, is more virtuosity and tromp l’oeil. Each vegetable is a perfect still live of a vegetable. These are assembled to form a face which would fool you briefly from a distance. What is real, what is faux, all done with a sense of humor. Rudolf had his portrait done by Arcemboldo, reportedly his favorite artist, with a pair for his nose and a thistle for his chin(Mauries, p.129). While the portion of Rudolf’s wunderkammer in the museum is limited, the art collection here is not limited at all, being one of the world’s most eminent museums, ranging from Egyptian to the 18th century, and making for an enjoyable visit. The Natural History Museum across the mall traces its ancestry to Franz Stefan (1708-65) married to Maria Theresa (1717-80) who was elected holy Roman Emperor in 1745, almost 200 years after Rudolf’s birth. In 1748 Franz Stefan bought as core of his collection a 30,000 specimen collection of natural history assembled by a Florentine and former curator of the Medici duke of Tuscany whose dukedom reverted to Franz Stefan when the Medici line became extinct (MacGregor, p16). 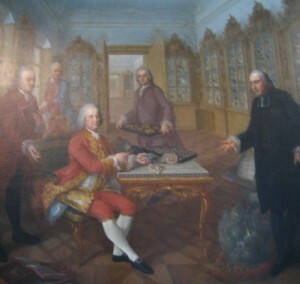 Here Franz Stefan is pictured with his collections in their original location. When he died in1765, Maria Theresa created the current museum in its current location. This collection is now embedded in a major modern museum of 20 million objects, but the museum still retains its “age of reason” feel, a holdover from Franz Stefan and the twilight days of the wunderkammer. One of the prizes in the mineral collection is Maria Theresa’s rock crystal (quartz) vase filled with a bouquet of flowers constructed of precious and semiprecious stones. The museum scope is encyclopedic. 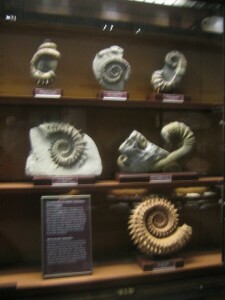 There are rooms of fossils, such as these ammonites. 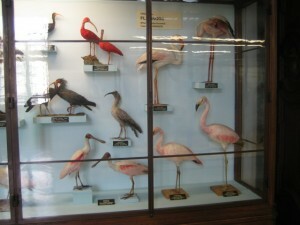 There are rooms of taxidermy such as these cases of birds in late 18th century glass cases. 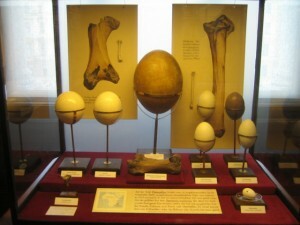 Here the eggs of ostriches and emus are compared with that (center) of the extinct elephant bird. 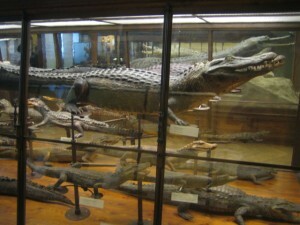 And the iconic crocodile is presented in the collection not suspended mysteriously from the ceiling but rather exhibited in the proper taxonomic grouping as proscribed by Linneaus. These two Vienna museums are first and foremost major modern museums but do retain outcroppings of the original feeling of wonder constructed by their Hapsburg emperor forbearers. You’ll need at least half a day in each museum. The Age of the Marvelous, Joy Kenseth (Hanover, NH, 1991). Curiosity and Enlightment, Arthur MacGregor (New Haven, CT, 2007). Cabinets of Curiosities, Patrick Mauries (London, 2002). General Introduction. This blog consists of 11 chapters (so far) discussing Austrian and German wunderkammern that can be visited today,despite being up to 450 years old, and comparing these to one I designed. In blog format, the first posting (chapter) is listed last and the last one (this one) first. Refer to the Contents, at right, to orient yourself…or if you don’t mind beginning in the middle, read on. 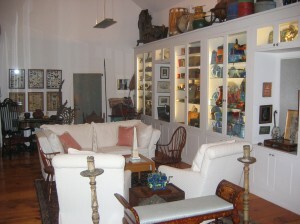 Antiques for sale, appropriate for wunderkammern, are shown in Inventory and by Category, listed below Contents (right). A client commissioned me to build a modern wunderkammer for him. This chamber of curiosities occupies an entire 2-story cathedral-ceiling room about 32 feet long and 14 feet wide. 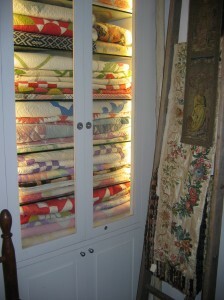 It contains 9 cabinets which are 8 feet tall with glass fronted sections above drawers. These are interspersed with windows. Above the cabinets is more display space loaded with over-sized objects. (The architect was Scott Phillips of New York.) 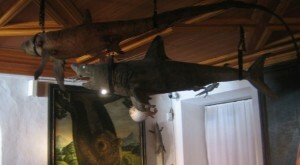 The end walls are partially hung with art and specimens and the ceiling with a small crocodile. The blank spaces on the end walls and ceiling represent the areas set aside for collection expansion. Upon completion, virtually every square inch will be covered. This chamber of curiosities has a second-period format, with an age-of-reason feel. 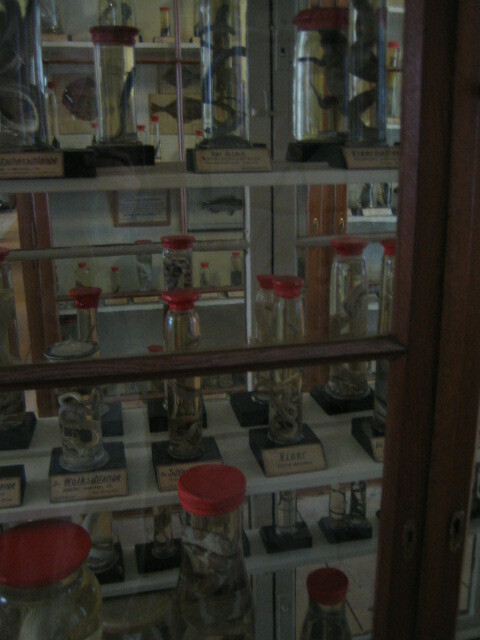 Here similar items are grouped together and displayed in a manner which adheres to modern taxonomic notions. 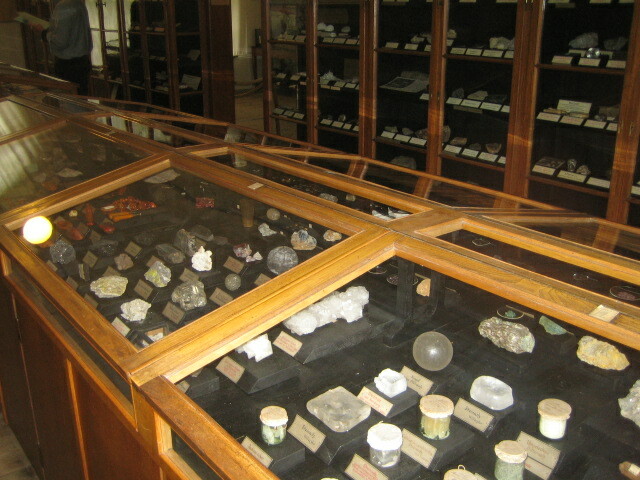 Along the south wall, items of natural history and science are displayed, and the minerals are presented by mineralogical family, the shells by genus within family, etc. The facing wall includes man-made materials, textiles, ethnographic artifacts, boxes and tools, also presented in a logical manner. As discussed in chapter 2, first-period wunderkammern would have more of a helter-skelter feel. 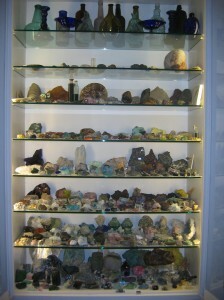 You first encounter a reasonably large mineral collection consisting of about 1500 of the world’s 4000 known minerals. The silicates are segregated from the sulfides and sulfates, etc. Some minerals are represented by beautifully-formed crystals, such as tourmaline and aquamarine. The specimens tend to be relatively small sized…fist size or smaller due to the space constraint. The extra-terrestrial section includes a meteorite found in Namibia and a piece of the Challenger space shuttle found in the Bahamas. 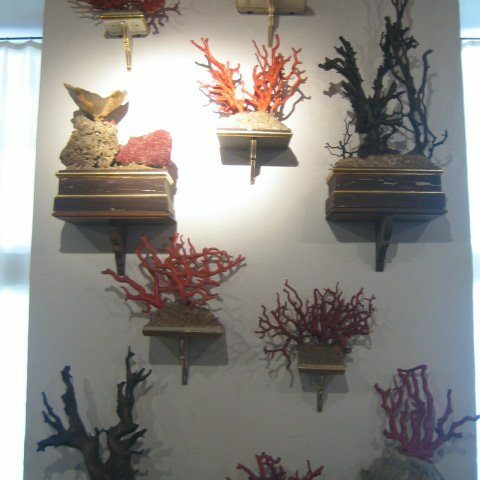 Two sections are dedicated to shells. You’ll note the drawers below are filled with specimens as well. This collection also includes about 1500 specimens, including some of the great rarities like the golden cowries, worn by Tahiti Chieftains as the emblem of their authority, and the imperial slit shell, traditionally thought to become automatically the property of the Emperor of Japan whenever recovered from the sea. 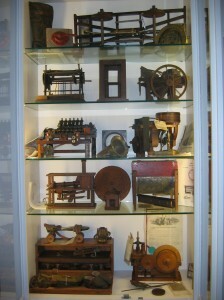 The next section displays a collection of US patent models from the period 1836 to 1880. 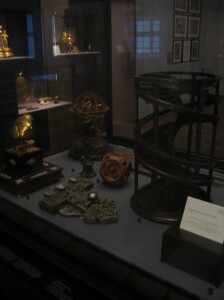 This section represents science and technology, a typical wunderkammer theme. 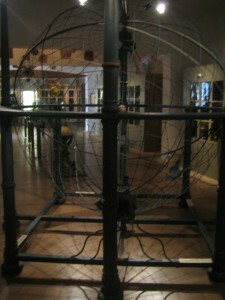 In the US, patent applications were normally submitted with a working model demonstrating the invention. To save space the Patent Office required these to be no bigger than a foot in any dimension. If the application was granted, the patent number was sequentially assigned –patent #1 was issued July,13,1836–and the model was put on display open to the general public at the Patent Office in Washington, DC. This was a very popular tourist site in the 19th century. 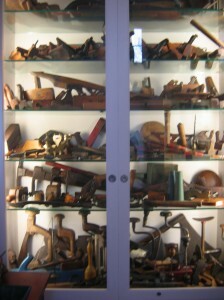 Here are a variety of wood working tools, drills, planes, hammers, saws, etc, through out the ages. Examples of the ax here date from as early as 4000BC and continue through Minoan Crete, 2000BC, through Roman, medieval, and to the 17th through 19th centuries. There are stone-age examples as well, from prehistory through American Indian to modern-day New Guinea. It’s fun to trace the evolution of such a simple and necessary item throughout history. In the next section, see all the variety the simple idea of the box congers up. These examples date from the 17th to 19th centuries, represent all cultures, and are executed in all materials, from straw to gold. 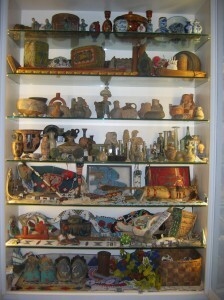 This next section displays ancient and ethnographic material. The top two shelves are Asian, the next, Mesoamerican, the next classical Egyptian, Greek and Roman, and the last three shelves, Native American. Some connections are unexpected. For instance, all the glass beads here, those from 18th century China, 19th century Sumatra and Africa, those from 19th century Aleutian Islands, and those from 19th century American plains Indians were all made in the small Italian city of Venice. Venice had the world-wide monopoly in glass bead making from the renaissance through the 19th century, a monopoly it maintained by forbidding , on pain of death, its glass bead workers from leaving the city. A collection of textiles includes a number of American quilts as well as 16th through 18th century needle works. Not shown are other collections of bronze-age implements, glass bottles from Roman to the 19th century, birds’ eggs from 19th century collections, butterflies, and so on. 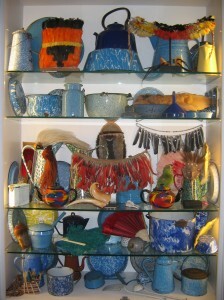 This last section shows two unrelated collections, one of 19th century American enameled granite ware or agate ware (a cheap decorative surface put on common cookware to brighten up the day of the common man) and one of items decorated with feathers (from exotic feather headdresses from the jungles of Peru and New Guinea, to a pre-Columbian c 800AD cotton and feather pouch–top shelf, left–to fans and ladies hats from the Roaring 20’s.) These two materials contrast sharply, one being cheap, plentiful (at least at the time of manufacture), and indestructibly utilitarian, the other being rare, exotic and fragile. Yet when juxtaposed next to each other, a certain tension is created which adds drama to the presentation. This intentional juxtaposition is what the first-period wunderkammernists strived for. Moreover, alternating the two kinds of items was specifically recommended by Samuel Quiccheburg in his important treatise on wunderkammern, published in 1565, considered the definitive manual for marvels and curiosities. This wunderkammer, I am assured, helps the owner celebrate on a daily basis what a great world it is, brings him much pleasure, and improves his mind. Do you know of any private curiosity cabinets, large or small which perform the same service for their owners? Please email me if you do at funstonantiques.com.